Red River Real Estate and Vacation Rentals - Trout Time, Red River, New Mexico. Your vacation begins here! This beautifully, recently updated, large upscale home in Valley of the Pines is just steps away from the river! This home has all the amenities you could want…...granite countertops, hardwood floors, ceramic tile, surround sound, Direct TV, Wifi, hot tub, 2 new large decks (one of which is covered) with amazing views of the river and valley, and a new extra large parking pad for all of your toys. Three bedrooms have premium KING beds with high thread count linens and the fourth bedroom has a premium Queen bed, also with extra nice linens. All king bedrooms have flat screenTV’s with DVD players. The new kitchen offers stainless steel appliances and is well equipped for all your cooking needs. Just outside on the covered deck, there is a gas grill, bar, and small refrigerator, that will allow you to take in the beautiful mountainous views. All bathrooms have been remodeled with luxurious 5 star amenities, and this home boasts a tankless water heater providing constant hot water for our quests. The upstairs living area has a mini kitchen, coffee bar, and a gas fireplace. Some of the best fishing is right outside the front door! Hiking is all around! Hop on your ATV/UTV's and take off!! Roast marshmallows with the kids and dog around the fire pit or drink a chilled glass of wine with your honey in the new 6 person hot tub. All of this and more can happen at Trout Time! 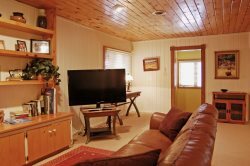 The property is located on the end of a road that backs up to the National Forest, so rest assured, it is a quiet, private location for your vacation. This Property Offered by Red River Real Estate, Red River,NewMexico. 4 Bedrooms, two and a half bathrooms. 3 King Beds, One Queen bed, One Queen Sleeper Sofa, and a Twin Sleeper Sofa. Trout Time Free Wi-Fi, gas BBQ grill, and a fire pit. Beautiful property and very relaxing!